The ability to see who is on your site at any given time is information that all Marketers look for when they are reporting on unique site visits, sign ups, and web traffic. If you are on our Standard Plan or above, Live View is a feature that is included in your plan. When you are using Drift Live View you are able to see, in real time, who is on your website at any given moment. 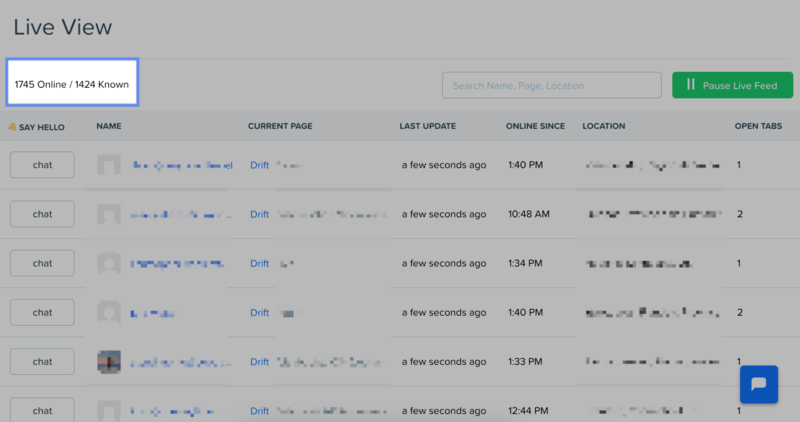 Whether it's returning leads or new site visitors, the Drift Live View is a table that changes as people switch pages, come, and go from your site. We know that a lot of marketers use Google Analytics to see how many visitors are coming onto their site at any given time, as well as using Live View. So when you, as a marketer, are looking for data on how many visitors are on your site at any given moment, Google Analytics and Live View are two good resources to access this data, but sometimes the numbers do not align. The way that Google Analytics defines a "session" is different from the way that we at Drift define a "site visit". A site visitor arrives to your website and clicks around a little bit. Then, this site visitor, who has another tab open, clicks out of your website for 31+ minutes, but keeps your website open in that tab. When that site visitor clicks back to your website after 31 minutes, an additional session has started for that user. Our Live View acts differently. We maintain an active web socket on the page, which means that even if your site visitors have other tabs open including your site, we will continue to show them on Live View as an active session, whereas Google Analytics will end that session after 30 minutes. This means that Google Analytics' counts will typically be less than Drift's because they close out an "active user's session" on your website after 30 minutes while we will continue to count them as "on your site" until they close their tab that has your website open on it.